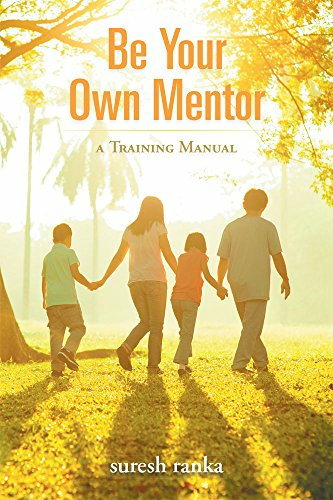 “Be Your Own Mentor” teaches how smartly to resolve any complex problem and face any challenge head-on. The book, with three, five & seven star practices (3*, 5*, 7*) may be used any time and many times as a ready-reckoner, for Newly Married, Foetus, Infant, Pre-teenager, Teenager, Youth, Family/Social-Member, Senior Citizen, Colleague, Healthy or Ailing Person and for the one, aspiring for a pleasant death. HAPPINESS vs. PERSONALITY: Lord Buddha said, “There is no path to happiness, happiness is the path”. Only a pleasing personality can lead a happy life. The potential to upgrade personality depends upon:- 	Will power 	Total health, and 	Support from family/group Personality-upgrading is literally a child’s play and can be started at any moment. Surprisingly its benefits are multiplied for the one, who keeps teaching the practices to well-wishers/strangers. WILL-POWER is a prerequisite for every performance, whether ‘moving a finger’ or moving the masses. To overcome procrastination, the best yogic practice is Surya-Traatak (Orange Sun Gazing) 	OSG is for adults with normal healthy eyes and during normal emotional, mental & physical state. 	Without permission from an ophthalmologist, OSG may not be practiced by a person undergone eye-surgery or suffering from glaucoma etc. 	FREQUENCY: OSG may be practiced regularly or irregularly, at dawn and/or dusk 	DURATION of gazing may be optimized by trial method 	PROCEDURE:- a) At dawn and/or dusk, when the DARK orange sun is without glare and not covered by clouds b) Thoroughly wash your eyes, preferably using two eye-cups together for both eyes c) Stand or sit comfortably facing the orange sun d) Remove window glass pane e) Remove spectacles f) Start now & CONTINUE till last, SOUNDLESS, slow, long, deep inhalations and normal exhalations g) Start gazing directly into the orange sun h) Blinking is neither necessary nor prohibited; be comfortable i) When you feel OK, drop the UPPER eyelids and continue gazing through the eyelids with deep inhalations j) Repeat the steps (g) (h) & (i) k) Continuing deep inhalations, lie down or sit comfortably and cover the closed eyes with palms one over the other or wrap a cotton black cloth/dupatta l) With the closed eyes, have a lingering view of hazy sun, the surroundings and the sky m) When feeling absolutely normal, slowly open your eyes! Close again! Open! Close again! open Note: 1)	Later in the day a BURNING sensation in the eyes implies that either the total duration of gazing was longer than desirable or there was a glare in the sun; in which case I.	keep the closed eyes wrapped with wet folded cotton cloth for 20 minute, 3 times a day II. Skip the gazing practice for 2 days III. Next time optimize the duration of gazing 2)	From day one, you will feel, energy is adding up 3)	Procrastination vanishes after a few regular/irregular sessions while physical, mental, emotional & spiritual energy level enhanced remarkably, then 4)	Without being greedy for much energy, one may taper off the frequency e.g. alternate days, twice a week, weekly, fortnightly and discontinue. 5)	The positive effect is not likely to be permanent; hence one may repeat OSG after a few weeks or months. Important: Surely, OSG is ought to bless a practitioner with many more benefits towards physical, mental, emotional, spiritual health which cannot be described in words. It is said that OSG enhances the power of eyes and one may get rid of spectacles. HEALTH FIRST Referring ‘Health Audit’ chart (Master-List) one can examine most health parameters (physical, mental, emotional, spiritual) to identify the aspects to be improved and then opt for relevant practice/s. Depending upon the severity of ailment and urgency to cure, one may plan the frequency of a practice and holding time of postures. ANAPAAN (Vipassana): 1)	Foundation of ‘personality’ is ‘spirituality’, which can be enhanced by practicing Lord Buddha’s ‘Anapaan’ 2)	The Anapaan Practice:- mentally watch/follow/observe/feel your breath (absolutely uncontrolled, natural, normal, effortless & soundless breath, without holding it) 3)	Anapaan improves performance i.e. THE BEST results from ALL the activities. 4)	Anapaan can be practiced at any age, by anybody (ailing, healthy, physically impaired), anywhere, anytime, in any posture, with open or closed eyes 5)	DURATION: one breath or more breaths 6)	FREQUENCY be increased stepwise; using mobile phone’s hourly/half hourly clock alarms 7)	Gradually increased frequency makes anapaan a whole time SUBCONSCIOUS activity 8)	HERE & NOW: while you are reading these lines, have a break to practice anapaan for a few breaths. 9)	Put a clock alarm for TONIGHT’S bedtime 10)	Through anapaan, INDUCE the sleep tonight and verify the effect TOMORROW morning Anapaan MUST be practiced:- 	At the bed time, to induce sleep 	Just before & during vital activities like a)	writing an exam paper b)	mating for pregnancy c)	inducing willful pleasant death 	While holding a yoga posture 	To eradicate anger, depression, attachment, agony, jealousy, greed etc. 	For speedy healing of ANY ailment whether high BP or a bone fracture 	To cure/manage disease like cancer, by combining 24x7 anapaan with very long comfortable DEEP INHALATIONS in PURE atmosphere FAMILY for EVER Every family member is delighted to welcome a new born baby. The reader may learn, teach and practice ‘Joyful-Grooming’ of a child, which is a rewarding experience, a lifetime achievement and as easy as a child’s play; the crux being ‘Catch Them Young’. With increasing age of a child, the degree of difficulty increases, both for a child and for a parent/teacher, needing more patience & perseverance. Grooming a pre-teenager is more joyful than that of a teenager. It is said that, “A parent is the first teacher and a teacher is the second parent”. To upgrade personality, the most vital and LIFETIME focal-point is the SHARP-punctuality of going to bed soon after punctual YAWNS (sharp 9 pm for STUDENTS) NATION NEEDS YOU Every adult MUST persuade the well-wishers and strangers to study and participate in the country’s POLITICAL-SYSTEM to contribute in nation-building.